Judge Conference report. 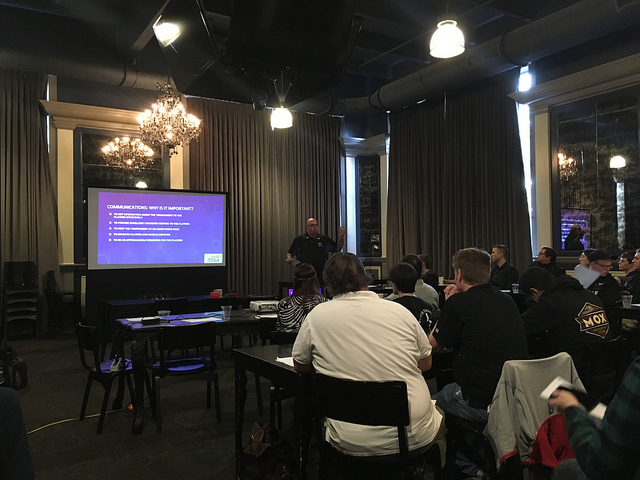 On January 12th, 2019, 48 judges gathered at Mox Boarding House in Bellevue, Washington, for a community focused Judge Conference. 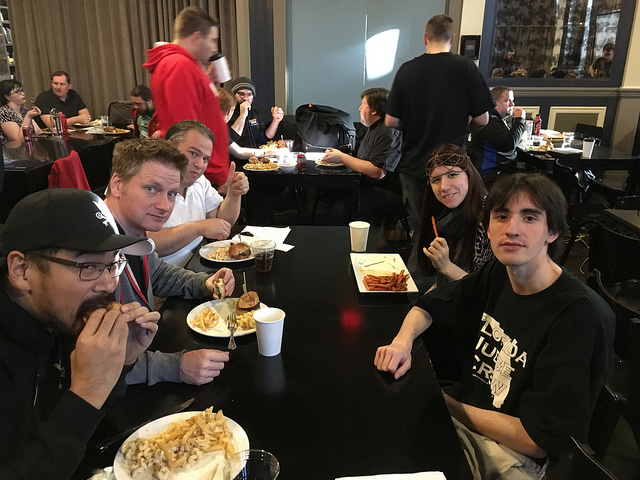 The organizers stated the goals of the conference were “to focus on L1 judges improving on rules, policy, and procedures, and building good relationships with others within the Magic community.” There were six speakers and a catered lunch provided by the judge program. Two attending judges were happy to give their perspective here on the first conference in the Northwest Region in 2019! In the region with the largest geographical area, it is nice to know you are never left on completely on your own. The 2019 Northwest Judge conferences helped make things feel just little smaller. I was particularly impressed with all of the presentations. The presenters were very well prepared and charismatic. I could really tell that everyone had put in the time to practice their material. There were no noticeable technical issues once we got started. Derek Barbee taught us how to conquer our fear of mistakes in part by getting help from peers and using online resources such as IRC and our region’s slack chat. At lunch I met with Joe Klopchic about creating some steps towards my L2 advancement. Mentorship is essential for getting the experience and recommendation required for testing. Mox put together an outstanding lunch buffet. When the sliders ran low, Stephan quickly ordered more for the last people in line. The food was fantastic and the venue royal. Jeremy Button taught us about introducing ourselves as a Judge to TOs. It gives us tremendous strength to have the Judge program’s support behind us rather than just as individuals. 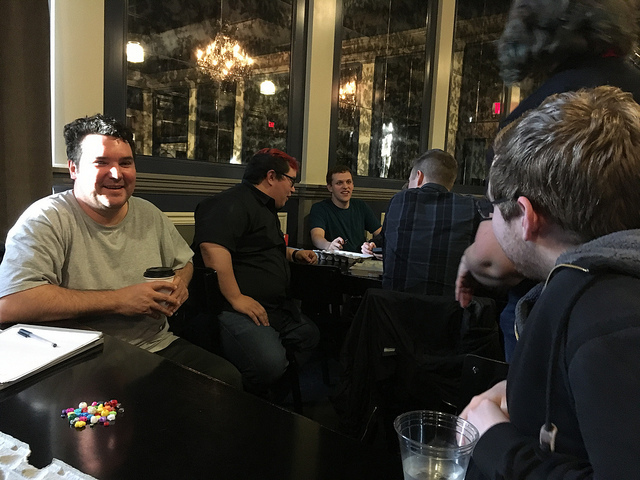 Between sessions I was able to chat with James Lee about a new Library Magic group I’m starting. He had some very encouraging words and pointed me to a free activity kit. Overall, the conference was a valuable opportunity to connect and learn. You see what I did there? 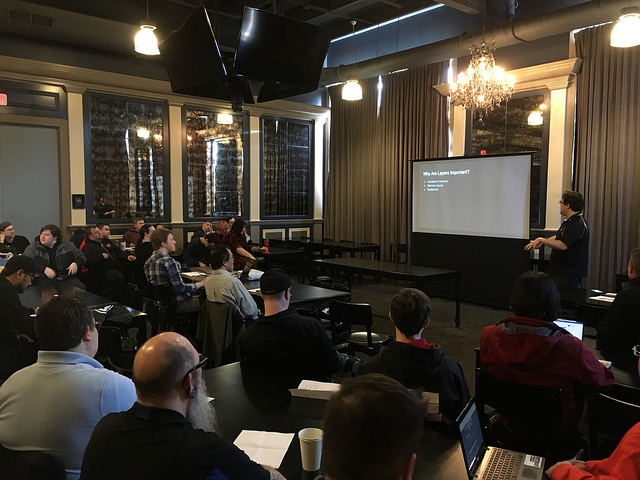 In case you didn’t catch it in Ryan’s perspective, the 2019 Western Washington Conference was held at Mox Boarding House-Bellevue. It’s a venue I’ve been to quite a few times, which definitely eased my worries about going to my first conference since transplanting to the Pacific NW. (I came from Colorado, NW region has always been home). Can you spot Kimberly in this photo? After receiving the presentation schedule a week or so before the conference, I was very excited about all of the presentation topics. Joe Klopchic gave his fantastic layers presentation, which is engaging due to its entertainment value and clever examples to test your knowledge with. Layers is definitely still a skill I am working on and this presentation, and helpful handout, were super beneficial. Joe was followed by Derek Barbee, who gave a phenomenal presentation on making mistakes while judging. I especially enjoyed Derek’s take on the topic as he not only covered common mistakes that Judges might make, but also identified reasons we tend towards these errors. Common things like being afraid of getting something wrong or wanting to feel confident. I found great value in a presentation that not only helped me recognize common mistakes I might be making, but also reasons for them. Plus Derek is extremely energetic and very engaging. Last up before lunch was Jeremy Button and his presentation on TO interactions. This presentation was especially interesting for me, as I have experience working for a TO and helping support events. One of the coolest things I saw was Jeremy breaking down the investment vs income dollar amounts, which provided a perfect answer for the all too often asked question of “why is this event so expensive?” I really enjoyed the additional tips on how to connect with TOs when you’re new to an area. Definitely beneficial for any newer Judge in the audience. Lunch time! Lunch was amazing, but it turns out Judges really like sliders. 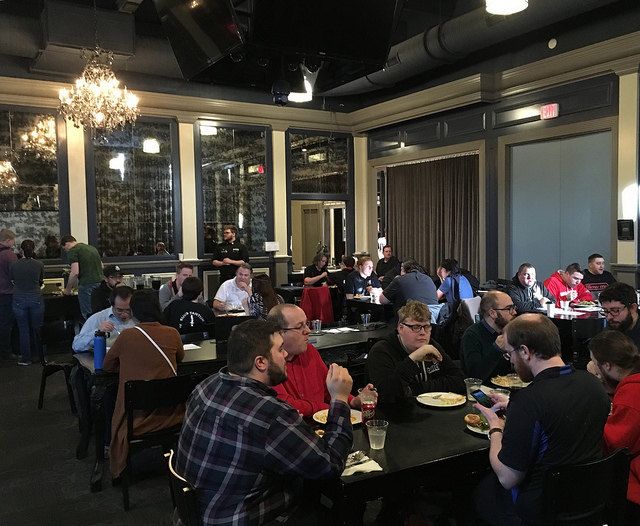 So much so that when the amount for 50 people ran out, our wonderful conference organizers had to order more food. But it was all delicious. The lunch break also gave me an opportunity to connect with some Judges I don’t see regularly, since Portland sometimes feels so far away from Seattle. After lunch, Ken Nichols got us back on track with a presentation on the new take-back rules. Set to the theme of Taking Back Sunday’s greatest hits, it was definitely engaging. I think this presentation was of great value, because I personally feel these new take-back rules can be a little fuzzy and it was nice to have a clearer picture on how they might work logistically. After Ken, we started the back-to-back guest appearances of some friends from the South. Erin Leonard gave a presentation on diversity in the Judge program, complete with beads! Beads, you might ask? Erin provided the group with a unique hands-on activity that definitely generated some discussion around topics related to diversity. I won’t spoil it for you, in case you get the honor of seeing this presentation, but it was very clever. Diversity can often be a tricky topic to approach but Erin handles it masterfully. Closing out the day was a customer service presentation from Michael Arrowsmith . He presented us with a very clever visual diagram of ranges of responses to players, including playful banter or that all-too-serious face needed when dealing with things like DQs. Michael also included some actors from the crowd for a few skits and gave attendees the opportunity to practice skills such as handling calls and making head judge announcements. It was a presentation very well done. After a wrap-up conversation in small groups, we were turned loose. Overall, I think the entire day was beneficial for all Judges who attended, whether they were a brand-new L1 or a seasoned L3. 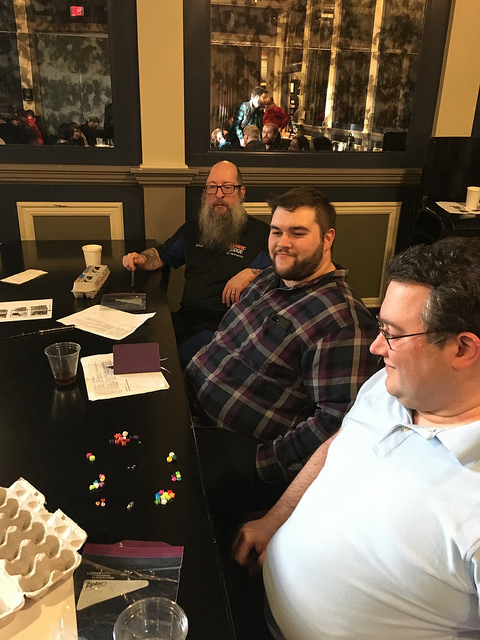 I think this gathering definitely showed off the mox-imum potential that a conference of dedicated individuals can have. Thanks for reading judges. We’d love to hear about your next conference experience, and feature it on the Northwest passage. For further reading, you can read the conference report of one of the presenting judges!